Cheesecake is a perennial favorite in both commercial and noncommercial settings. 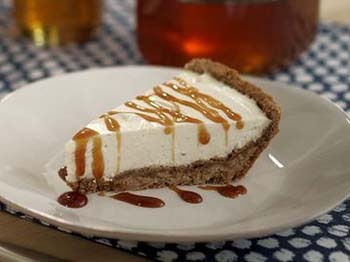 Chef Guas gives this comfort dessert a twist with a crust made with clover honey and whole-wheat flour. The flavor is echoed in the creamy vanilla filling, which uses alfalfa honey, another varietal. Preheat oven to 325°F. In small saucepan, melt butter. Prepare Crust: In mixing bowl, combine flour, brown sugar, baking soda, cinnamon and salt. Add butter, honey, water and vanilla. Using the paddle attachment, mix on low speed until dough forms, adding more water, 1/2 tsp. at a time, if needed. Remove dough from mixer. With fingers, gently press dough evenly into bottom and up sides of 9-inch tart pan or pie plate. Bake 7 minutes for tart pan or 15 minutes for pie; cool completely. Meanwhile, prepare Filling: Submerge gelatin sheets in bowl of ice water and allow to soften or bloom for 5 minutes. Place cream cheese in metal bowl above boiling water and let it melt, stirring occasionally. In large mixing bowl, combine sour cream, honey, vanilla bean seeds, heavy cream and salt. With whisk attachment of electric mixer, whip until soft peaks form. Remove cream cheese from heat. Squeeze excess water from gelatin sheets and whisk gelatin into cream cheese. Add about 1/2 cup whipped sour cream mixture; whisk until smooth. With rubber spatula, gently fold the remaining sour cream mixture into cream cheese mixture. To assemble, scoop filling into crust. Refrigerate uncovered for at least 2 to 3 hours. When firm, drizzle with a darker honey, if desired.